A few weeks ago I was encouraged to remember: Velikovsky gave us “The Electric Universe”. I have no problem with the underlying sentiments expressed in those words of encouragement. However, I do have a few problems regarding their accuracy. Immanuel Velikovsky didn’t write about “The Electric Universe”. He wrote about Gravity being an Electromagnetic phenomenon. Gravitation is an electromagnetic phenomenon. There is no primary motion inherent in planets and satellites. 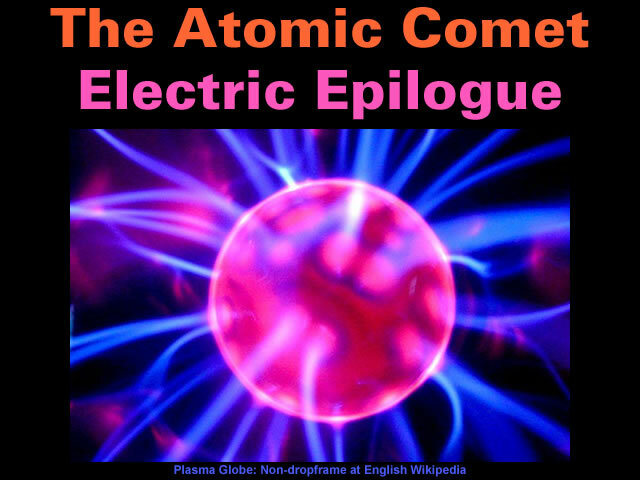 Electric attraction, repulsion, and electromagnetic circumduction govern their movements. The moon does not “fall,” attracted to the earth from an assumed inertial motion along a straight line, nor is the phenomenon of objects falling in the terrestrial atmosphere comparable with the “falling effect” in the movement of the moon, a conjecture which is the basic element of the Newtonian theory of gravitation. Immanuel Velikovsky didn’t give us “The Electric Universe”. He simply resurrected and recycled old ideas for a new generation. Section V – Theory of Olbers and Bessel. The comet of 1811 first drew the attention of Olbers to the subject. Biot has given his adhesion to this theory. Sir John Herschel’s view is nearly the same. It is not improbable, he observes, that the sun is constantly charged with positive electricity ; that as the comet draws near the sun and its substance becomes vaporised the separation of the two electricities takes place, the nucleus becoming negative and the tail positive. The electricity of the sun would direct the movement of the tail, just as an electrified body acts upon a non-conducting body electrified by influence. M. Liais, in his work entitled L’ Espace Celeste, has pronounced in favour of a repulsive force of an electric nature. According to this astronomer the calorific action of the solar rays causes a physical and chemical modification of the molecular condition of the nucleus, and thus gives rise to the two electricities. Whilst the nucleus is charged with the one electricity, the opposite electricity becomes developed to the more attenuated and lighter portions, and is carried by them to the limits of the cometary atmosphere. But, on the other hand, the sun himself is constantly in a state of strong electric tension. And of the two electricities that which he possesses in excess will attract, for example, the nucleus, if it should be charged with the opposite electricity, and will, in the same way, repel the molecules of the electrised atmosphere. Bessel compares the axis of the comet to a magnet, one of whose extremities or poles is attracted to the sun, whilst the other extremity is repelled. Another possible cause is electrical repulsion. The probability of this cause is suggested by recent discoveries in radioactivity and by the fact that the sun undoubtedly sends forth electrical emanations which may ionize the gaseous molecules rising from the nucleus, and lead to their repulsion from the sun, thus resulting in the phenomena of the tail. He also resurrected and recycled the Hydrocarbon Comet for a new generation. The next question in logical order is one of great difficulty. It is whether the nucleus of a comet is an opaque solid body, a cluster of such bodies, or a mass of particles of extreme tenuity. Some light is thrown on this and other questions by the spectroscope. This instrument shows in the spectrum of nearly every comet three bright bands, recognized as those of hydrocarbons. The obvious conclusion is that the light forming these bands is not reflected sunlight, but light radiated by the gaseous hydrocarbons. Since a gas at so great a distance from the sun cannot be heated to incandescence, the question arises how incandescence is excited. The generalizations of recent years growing out of the phenomena of radioactivity make it highly probable that the source is to be found in some form of electrical excitation, produced by electrons or other corpuscles thrown out by the sun. The resemblance of the cometary spectrum to the spectrum of hydrocarbons in the Geissler tube lends great plausibility to this view. Magnetohydrodynamics (MHD; also magneto-fluid dynamics or hydromagnetics) is the study of the magnetic properties of electrically conducting fluids. Examples of such magnetofluids include plasmas, liquid metals, salt water and electrolytes. The word “magnetohydrodynamics” is derived from magneto- meaning magnetic field, hydro- meaning water, and -dynamics meaning movement. “spy jargon for a favorite and frequently used gimmick of the clandestine professionals. When their veil of secrecy is shredded and they can no longer rely on a phony cover story to misinform the public, they resort to admitting – sometimes even volunteering – some of the truth while still managing to withhold the key and damaging facts in the case. Therefore, as a counterbalance, it’s useful to take a closer look at the Electromagnetic Moon. The Moon, being our closest neighbour, provides some excellent observational evidence. Fluid Dynamics suggests the Solar Wind propels the Moon and the Earth along their orbital paths around the Sun whilst imparting rotational spin via the Magnus Effect. The characteristic “slow rocking back and forth” of the Moon suggests Magnetism may be a factor influencing the Moon’s visible struggle to keep one hemisphere facing the Earth. However, this simple picture is only approximately true: over time, slightly more than half (about 59%) of the Moon’s surface is seen from Earth due to libration. The “slow rocking back and forth of the Moon” provides clear support for Velikovsky’s statement: “There is no primary motion inherent in planets and satellites”. 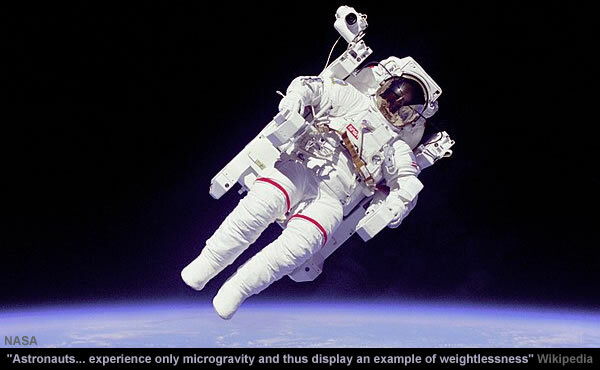 The “slow rocking back and forth” also illustrates “microgravity” where orbiting objects experience “weightlessness” as the motion of their micro-masses are influenced by micro-forces. At this point in the narrative advocates for Newton’s Law of Universal Gravitation might enjoy calculating the Gravitation Force exerted by two weightless orbiting objects. The Total Magnetic Field Strength of the Moon suggests the Far Side of the Moon may be magnetically repelled by the Earth. To get a handle on the Earth’s Magnetic Field it’s necessary to return to Sir Edmond Halley [1656-1742] who realised the Earth has two Magnetic Poles on the surface plus two Magnetic Poles on an inner sphere at a depth of about 800 kilometres i.e. 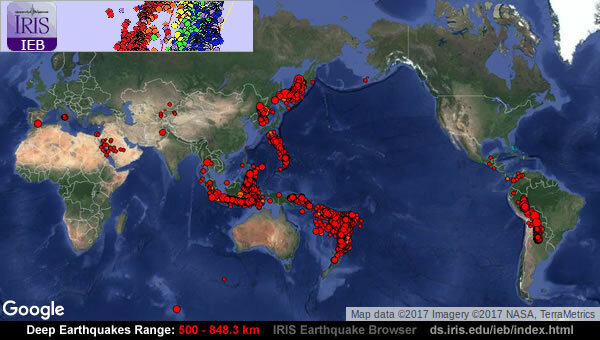 where earthquakes originate. As data accumulated, Halley noticed how the line of zero declination drifted westward. 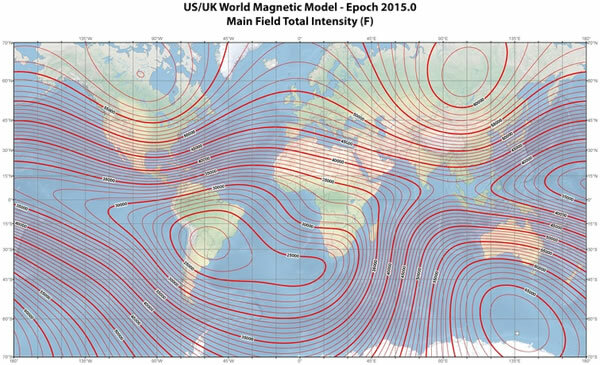 Apparently the whole pattern of Earth’s magnetism was creeping toward the west at a pace that would complete a circuit in a couple thousand years. To explain this curiosity, Halley proposed that the Earth has two north and two south magnetic poles. Two of these poles lay on the surface, the other two lay on an inner sphere about 800 km deep. By cleverly adjusting the slow westerly rotation of this inner sphere, he could reproduce the observed variations to some extent. Putting these two planetary pieces of the Magnetic puzzle together yields some interesting results. 1) A quadrupole Earth attracts the Moon at apogee but repels at the Moon perigee. 2) Thus the weightless Moon repeatedly bounces off finite Magnetic boundaries. Given enough observations it’s possible to calculate averages for the Lunar Perigee and Apogee. 3) But, paradoxically, these average distances may never actually be observed. Like many natural systems, the weightless Moon has a tendency to repeatedly overshoot and undershoot the average. The Moon never arrives at it’s ever illusive equilibrium. 4) Similarly, it can be argued, the quadrupole weightless Earth is attracted towards the Sun at aphelion but repelled at perihelion. Thus the weightless Earth and Moon repeatedly bounce off finite Magnetic boundaries. 5) Overall, the rotation of the weightless Moon is dominated by the Earth Magnetically repulsing the Far Side of the Moon while it repeatedly bounces off it’s finite Magnetic boundaries. 6) Arguably, the slow spinning away of the Moon is driven by a decline in it’s intrinsic Magnetism. The Moon continues to spin away from the Earth, at the rate of 3.78cm (1.48in) per year, at about the same speed at which our fingernails grow. Perhaps the best analogy is a clockwork mechanism with Magnetohydrodynamic cogs that are [ultimately] powered by Atomic energy. But, as ever, the independent observer is encouraged to turn over the evidence in their mind. Gallery | This entry was posted in As Above So Below, Astrophysics, Atomic Comet, Books, Catastrophism, Earth, Electric Universe, Geomagnetism, Gravity, History, Liesegang Cavities, Magnetism, Moon, Science, Solar System. Bookmark the permalink. But astrophysicists didn’t want to know. MHD made their theoretical work easy compared with the intricate behavior of plasma discovered in attempts to harness fusion power—the so-called ‘power source of the Sun.’ Their ignorance of the real behavior of plasma was certain to lead to divergence between theory and reality, just as it did for fusion power. This is interesting. The drill-hole that produced the anomalous gravity readings was also targeted to test the nature of intense magnetic anomaly at depth; it failed. Much navel gazing and thinking and reading on the various links here. Other than that, I am lost for words at present – I just don’t know. Cosmos Without Gravitation is not Velikovsky’s most well-known work in fact I doubt that many have even heard of it. It must have been at the end of the 1960’s that I read Velikovsky’s Worlds In Collision followed by his other works. I can’t be bothered to read them again but some of the content has remained. As I recall he, and his fiend Einstein were not good with references. Velikovsky spoke about cosmic electric currents, discharges between planets and the net charge of the Sun and Earth. The planetary discharges were between Earth and Venus and Venus and Mars if memory serves and this I would guess prevented collisions due to like charge repulsion. I was around at the time and I recall that it was the astronomers who were most pissed-off to the extent that they became completely crazy and have remained so ever since. It was the time of the first NASA probes and just about everything they had written about Solar System astronomy was consigned to the bin. It’s because of the (unintentional) consequences of the Velikovsky affair that astronomers persist in calling cosmic electricity “magnetic fields”. The refusal to acknowledge hydrocarbons is also down to the old man. The problem with astronomers seems to be that they prefer playing with numbers to actually looking through a telescope. Donald Menzel (US astronomer, Velikovsky and UFO debunker extraordinaire he also had security service connections!) was angered by the Bargmann-Motz letter in Science, (supporting the predictions of Velikovsky) considering it to be ‘uncalled for. ‘ He seemed infuriated that Larrabee, Velikovsky’s book reviewer, in one non-committal passage had called attention to an ironical situation: in 1952, in the Proceedings of the American Philosophical Society, Menzel had offered calculations to show that if Velikovsky were right about electromagnetic forces in the solar system, the sun would have to have a surface electric potential of 10 to the 19 (10 raised to 19th power, 10 billion billion) volts – an absolute impossibility, according to the astronomer; but in 1960, V. A. Bailey, Emeritus Professor of Physics at the University of Sydney, claimed that the sun is electrically charged, and that it has a surface potential of 10 to the 19 volts — precisely the value calculated by Menzel. Bailey, at the time his theory was first published, was entirely unaware of Velikovsky’s work and of Menzel’s repudiation of it.